Everybody is added! Please keep them coming, I need at TON of background characters, for all five Clans, the Regime, and the Exiles! so, what angles do you want me to draw, exactly? just a few generic ones, or do you need specifics? Personality: Sassy and bold, she's not afraid to speak up for what she thinks is right and won't hesitate in saying whatever's on her mind. She can come across as mean or socially unaware, and in some ways she may be, but she doesn't feign friendship or kindness, despising cats that do. She believes in honesty, and, although she can be quite harsh or crude, won't tolerate unnecessary violence or cruelty. She tends to be a little hot-headed and quick to act, and can get herself into trouble quite a bit. Cats who she befriends are important to her, and she'd defend her loved ones with her life. I need one looking down from highrock, one looking up onto highrock, a close up shot looking down onto the rock (This will be where Littlestar is killed), and a few more that you can come up with. Thank you so much! Sorry to bother you with another question, but what size would you want the images? Featherpaw is petite and generally tinier than most cats. She has a lithe and slim build, and possesses smaller features (muzzle, nose, paws). She's considered delicate, graceful and elegant - a natural trait that RiverClan cats hold preciously. Most of her features are smoothly rounded, including her eyes and tufted ears, which gives her a sweet demeanour. Her thick and fluffy fur frames her face and body in a way that is mellow and appealing, which allows her an innocent and soft appearance. Featherpaw has a deeply soft and silky coat, and thick, inpenetrable, long-haired pelt. It seems to always oddly remain sleek and lustrous, with disordered, unruly tufts being a rarity. Her pelt is also, as most RiverClan cats have, extremely glossy, assisting in her swimming. 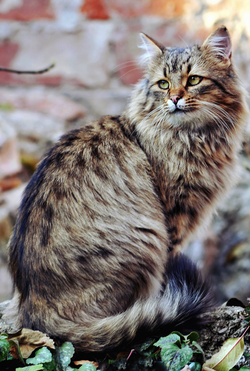 She has loose mackerel tabby stripes straying closely around her coat. 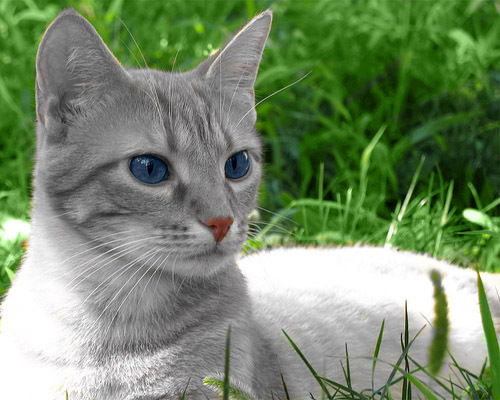 The dominant shade of her pelt is a soft, silver-blue pewter shade, and she has lighter porcelain undercoat and dark, misty gray stripes, which are not too faint, but not too visible. Featherpaw has light mint green eyes, mixed with a faint, fern green. Her eyes are pale and luminous, and not too vividly-striking, with a down-turned upper-lid. SCARS | Three thin, faint diagonal claw marks on her face, from above her right eye to below her left eye/cheek. She also has long, healed but very noticable slashes on her underbelly, which spread from below her chest to the end of her belly. Personality: During the events of Shade's exile, rise and Clan attacks, Featherpaw was a timorous, guileless, meek cat. She was extremely timid and severely lacked confidence, and was attacked by Shade. As a result of her frightened and anxious nature, she was wounded heavily. 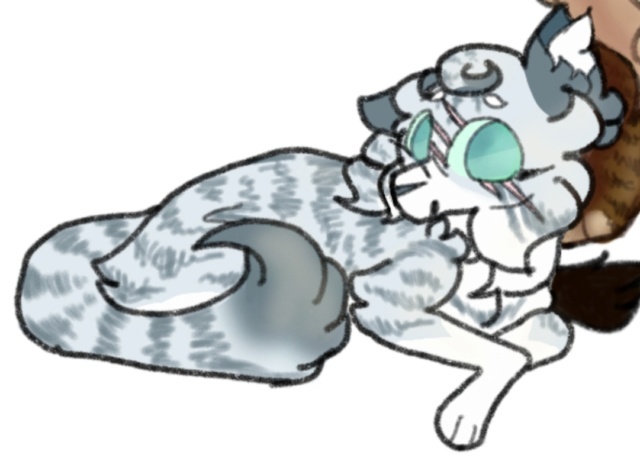 Now, during the Lichenmask & Eclipse Event, because she was confronted and mocked about her weakness and sensitivity, she's turned into a withdrawn, cold, scornful cat. She's desperate to prove she isn't a coward, so she changed to be all superior and high (although this will only be temporary ;) ). 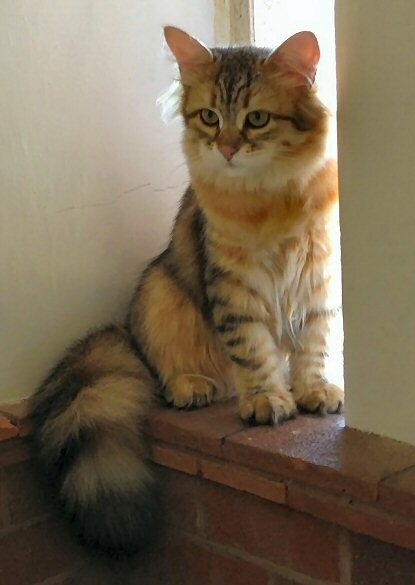 DETAILED description or picture: Shade is a lithe, toned-muscled, heavily battle-scarred, short-furred tabby tom with dark tangelo fur and very reddish brown tabby stripes, a dark vermilion nose, grayish brown inside of ears, muzzle, cheeks, chest, belly, and paws, and strong amber eyes. He has pale, grayish pink claw marks/scars over his left eye, chest, scruff, left upper foreleg, left upper hind leg, underbelly, and hindquarters, and a nick in each ear. Personality: Shade is a VERY violent and disturbed cat. From the moment he was born, he was filled with a hatred towards his mother and the world around him, and he finds great pleasure in torturing those weaker than him just to get a reaction and feel dominant and powerful. He craves power and will stop at nothing to get it. He's very prideful, sarcastic, snarky, and cruel with a twisted sense of humor, and he also has immense curiosity about the limits of one's limits which leads him to experiment on his victims, whether it be slow and painful torture or even cannibalism. Underneath the surface of pure hatred and vengeance, however, a small part of him still regrets all he had done and wishes that things could be the way they used to be when he was still a RiverClan warrior without the knowledge of his true father. He knows he can never take back what he has done, so he forces himself not to care about those he actually does care about, sabotaging himself into becoming more cruel and cold. I'll add more once there are more important topics for him. DETAILED description or picture: Scorchfang is a large, bushy, broad, long-furred tom with very dark gray fur, an even darker gray nose and tabby stripes, dark gray inside of ears, muzzle, cheeks, chest, and belly, and luminious vivid orange eyes. He has pale, grayish pink claw marks/scars on his muzzle and on his right shoulder running down his upper foreleg, and he has a nick in his right ear. He has large paws and a long and incredibly bushy tail. Personality: Scorchfang is a very kind-hearted cat. While he may have been rude, disrespectful, arrogant, and downright mean as a kit and apprentice, he has completely turned himself around during his warriorhood. He is hard-working, friendly, compassionate, and self-sacrificial, and he doesn't like conflict, even if it may be inevitable. He is constantly haunted by the demons of his past in breaking the warrior code by mating with RiverClan's Sweet, who gave birth to Shade. Even if he may be quite depressed sometimes, he is very optimistic and is willing to do all he can for his Clanmates, and sometimes even his allies. 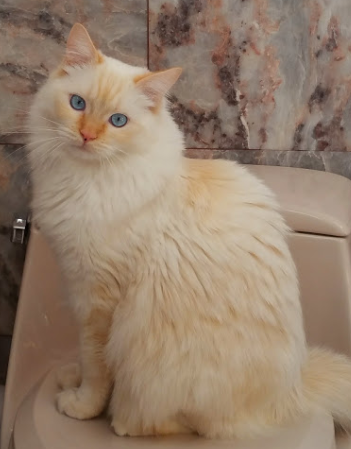 DETAILED description or picture: Snowdrop is a lean, beautiful short-furred she-cat with a white coat, a dark grayish sapphire blue nose and insides of ears, and luminous vivid cerulean eyes. 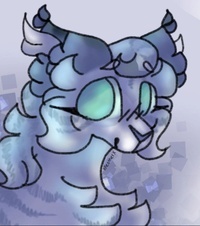 Personality: Snowdrop is a follower of Lichenmask, and therefore she follows his very same ideals in wishing to purify the Clans in the name of StarClan. She is very sweet and gentle and kind to her crush/mate Beetlemask, as well as friendly to the rest of The Exiles, but to anyone else she's cold, sarcastic, and mean. 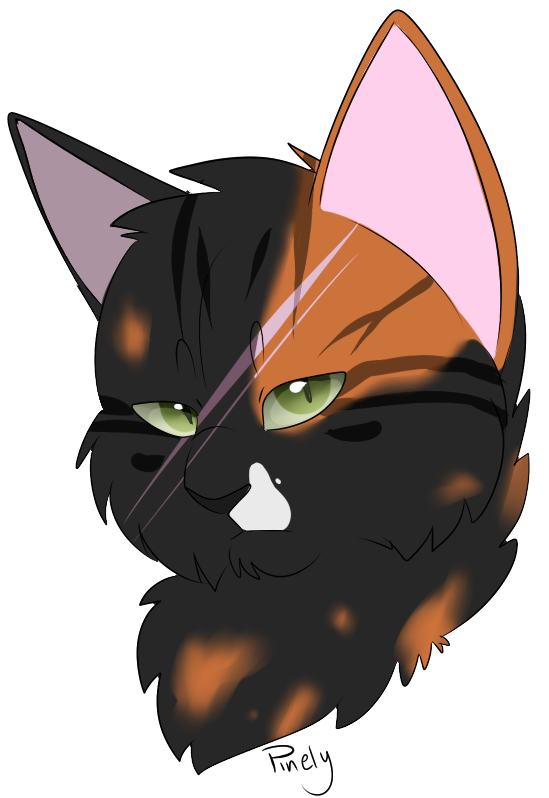 She absolutely despises Clan cats who are not pure, and she would have killed her own apprentices for not being pure ThunderClan if she could. She's also very picky about what she eats; she absolutely refuses to eat or even catch prey. Instead, she feasts on herbs, berries, seeds, and other types of flora as she was strangely born with the diet of an herbivore. She will, however, eat bugs from time to time just for the protein, yet she is very finicky about this. Give my wise old babby some screentime!! Leafstorm is a very gifted fighter and hunter, although he has a double-dose of PTSD from the war with Riverclan, which affects his fighting skills. Often times during a skirmish he takes things to far or panics and breaks down crying. 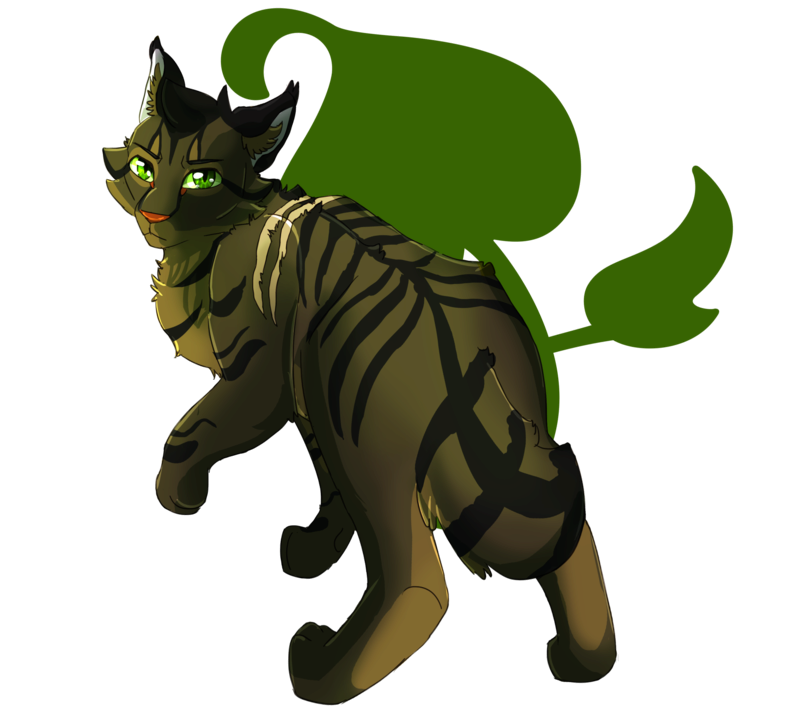 Personality: Leafstorm has grown wiser with age, and has also found new levels of maturity since the war with Riverclan. He's solemn, cold, and determined with all except members of his clan. Occasionally he can be friendly, but often times he's silent and brooding. 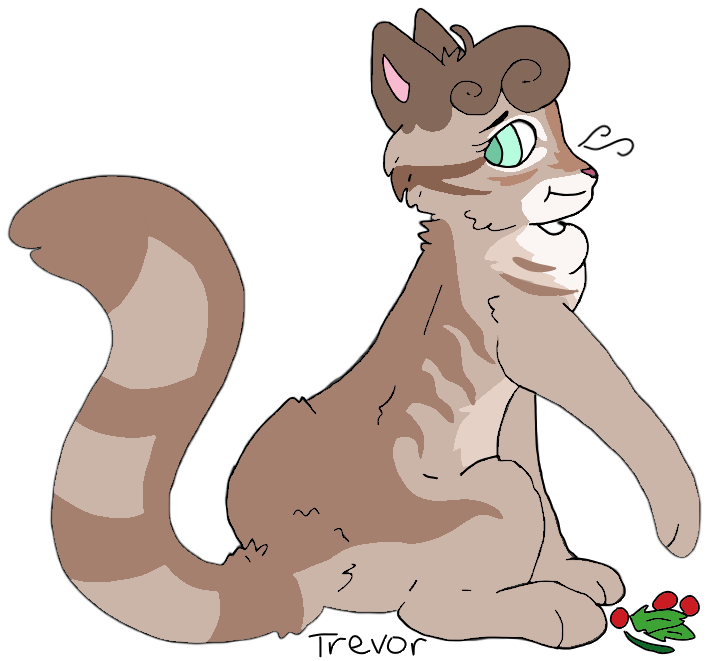 Leafstorm frequently pushes himself to the brink for his clan, and although his hardworking and serious attitude has turned him into a well-trusted and influential member of Thunderclan, it's also made him seem far colder than he actually is. DETAILED description or picture: A short-legged, plump, short-furred she-cat with large, murky green eyes, small ears, and a long, thick tail. Her whiskers are longer than average, hence the name. 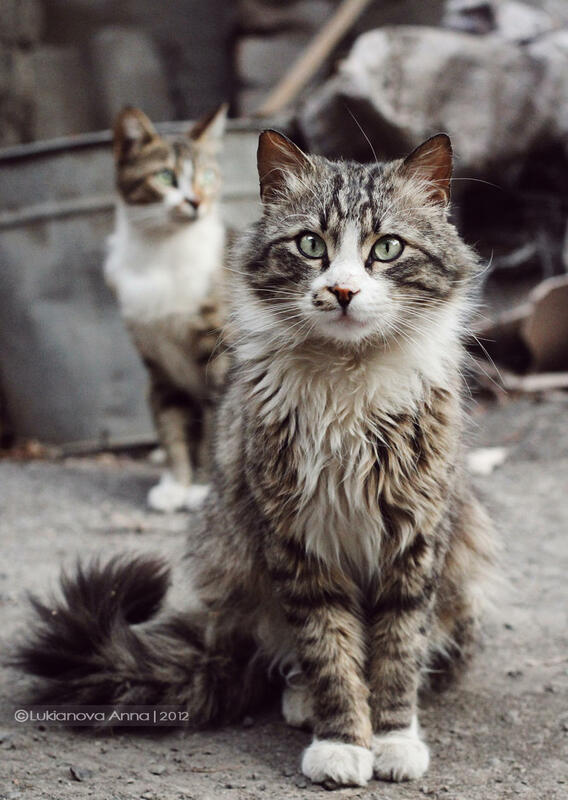 Personality: Mintwhisker adopts a serious, grumpy, no-nonsense attitude with apprentices, although, in reality, she's a very sweet and motherly she-cat. She's grown a lot since gaining her full Medicine Cat name, and now has an air of authority about her that makes most cats think twice before disrespecting her. What she lacks in strength she makes up for in exceptional memory, whit, and charm. Personality: Cunning, clever, and ruthless in battle, Thornleap's aggressive determination to gain Brindlestar and Lichenmask's favor have turned him into a cold-hearted rogue. Despite this, there's still a faint gentleness within him, and part of him longs to run on Windclan's moors, free from the choices he's made. He's still young and naive, and although he'd follow Lichenmask to the ends of the earth, in an alternate world he'd be at home wearing a big poofy sweater and drinking a warm cup of tea. Description: A short-legged, heavily built, thick-furred she-cat, Sharptooth's pelt is a flurry of scars- remnants from past skirmishes and battles. Her ears are large but not tufted, and one is shredded with multiple nicks and scratches. Sharptooth has a broad nose and shoulders, and a pink cute bunny nose. Personality: Sharptooth used to be fierce and aggressive but has become a shell of her former self since she was exiled from Thunderclan. She still possesses remarkable fighting skills, but since her unfortunate past, she prefers to not resort to violence. Currently, she's looking for a new purpose, and way to be good without living in Thunderclan. Alliance: Rogue- she lives in the barn so rn she's roomies with Lichenmask and the gang. Personality: Arrogant, defensive, and has strict rules for himself. 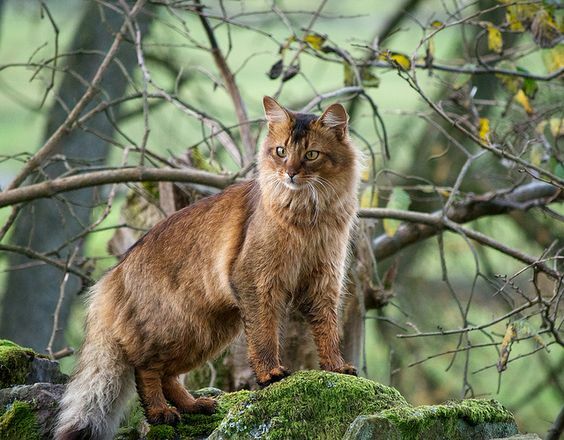 Doesn't believe that anyone outside of RiverClan deserves the same rights as RiverClan cats, and that they are basically just lawless creatures, like prey. Very loyal to RiverClan and his family, thinking that loyalty is the most important virtue a cat can have. Not afraid to voice his opinions, even if they are unpopular. Alliance: Former RiverClanner, now a follower of Lichenmask. Awesome! I'm currently on mobile, I can add all of you tomorrow! I have the intro shots and the first Shade picture done. I'll be posting the images in sets of five as I finish them, to keep all you guys updated. Also, once those helping with backgrounds get theirs done, could you do me a huge favor and post them to this thread as .png or .jpg images? Then it's easy to pop them into a low layer on each frame, and it's easy to copy/paste however many copies I need. I'm doing this in Krita, and using a video converter program to turn the images into a YouTube-friendly MP4 video. Here's your first background. Highrock looks a tad awkward, but i think the pic turned out okay. Thank you so much! It's beautiful! A very fluffy tortoiseshell tabby with minimal white covering. Her eyes are a neutral olive tone with a long series of claw mark scars that narrowly miss hitting her right eye. She has a patch of white on her right lip, along with on her chest, extending to the bottom of her belly, and on the tip of her tail and paws. Her fur itself is predominantly black with ginger splothes in them, which are covered in faint tabby marking (mackerel). She has another set of clawmark scars on her chest and a couple nicks out of her right hindleg's thigh. Personality: She's quite neutral about everything, most of what she does is not for greater moral reasons or to appease any gods (though she does worship traditional Chinese Folk Gods), but rather to benefit her own self. She owes her allegiance to the Regime and is actually mates to it's leader Shade. However, this does not make her heartless; she does care about other cats and will help anyone who's hurt or sick, as she still remembers being held prisoner herself and having to undergo cruel treatment and doesn't wish that upon any other cat. Of course, unless Shade wants them injured for a reason. A russet somali cat. She has vivid leaf green eyes and her left eye has a huge gash/scar around as she got beaten up by a raccoon. Her ears are tufted. Has a dark russet dorsal stripe and kind of a mane. Pelt darkens around her paws and tail tip. Personality: Pumapaw is vain, and has little interest in others, coming off as blunt and boring. She despises those with tainted blood, and believes that pure-bloods should have power over them. She follows Lichenmask in the hopes that he will put her ideals into practice, however she is terrified of individuals with more power than her. Pumapaw is scared of what they will do with it, and how they use it, this causes her to follow Lichenmask out of fear not just because of her beliefs. Puma is also very independent and prefers to do stuff her way and on her terms. Still, she isn't the smartest, bravest, or strongest cat by any means, but she is determined in what she does, and what she believes. Personality: Fallow is an extremely sweet she-cat, but starclan knows, when she gets stressed out, she gets stressed out. with Goldeneye being gone for an extended period of time, she was left to care for riverclan on her own, which also meant standing in Golden's place when it came to dealing with the prophecy until she got back. even with Golden back, though, she hasn't been able to catch a break. Golden is currently very sick, so she still stands as riverclan's main medicine cat, just with a little more help from Golden than she had before. in the short amount of time that she's been mca, she's been through more than some warriors do in a lifetime. now, I dunno if you're planning on including this or not, but when Shade and Jaystar face down, Fallowpaw will be there as well. this also may or may not be important- Shade will come across Fallow while she's out gathering herbs, and pin her down and threaten her, Jay, and Golden if she doesn't go get Jaystar immediately, which she does.